The physical, electronic, and kinetic properties of soft/organic matter are widely tunable and are often determined by their nano-to-mesoscale ordering. The complex interplay between structure and these fundamental properties is applicable in a host of technologies and therefore important in many research areas. Structure of these materials, however, is difficult to characterize. Our research explores the physics of X-rays resonant with electronic transitions within molecules and how they can be used to characterize ordering in organic systems. We focus on ordering phenomena relevant to organic electronics where much of the device function depends on nanostructure that occurs in the bulk and at interfaces. We use this novel capability to probe the physics of film formation and the origins of emergent optoelectronic properties of these materials in devices processed and tested in the lab. Broad categories of our research are outlined below. Follow links for more information. Fine structure near X-ray absorption edges have long been used for measuring bond type, distance, and orientation within molecular materials. However, studies utilizing this fine structure have often been limited to qualitative analyses mainly in spectroscopy experiments. We aim to define quantitative models of the optical interaction that occurs at these edges enabling dramatic leaps in nanostructure characterization when spectroscopy is combined with microscopy, scattering, and diffraction experiments. 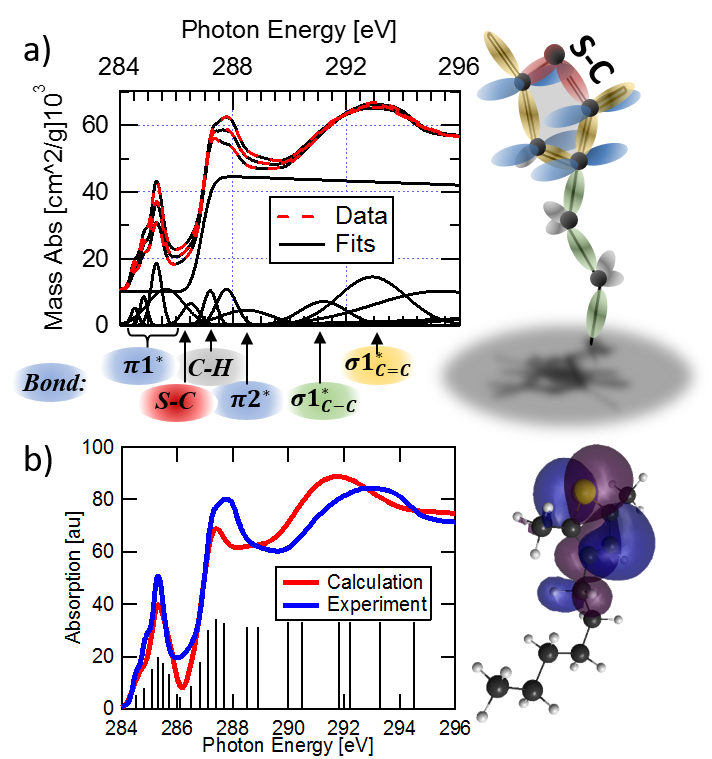 We combine both computational and experimental studies of molecules to create accurate but simple optical models that then can be used to extract information on organic nanostructures that would be impossible to obtain any other way. Such models are incorporated into physical models for imaging and scattering which themselves often must be modified from traditional treatments. We work with both model structures and nanostructured materials for novel applications being studied by world-leading collaborative researchers. As bottom-up self-assembly of molecular structures becomes a more prevalent target for next generation technologies, our research will produce the characterization tools critical for such targets to become a reality. We explore how fundamental excited states and charge dynamics are governed by ordering in organic, molecular systems. This involves studying and controlling how the materials are formed using both physical vapor and solution deposition techniques. We investigate a wide range of materials from archetypical molecules to novel, high-performance materials synthesized by world-leading chemists. Our projects also involve intensive characterization of both optical and electronic properties via a suite of time-resolved, spectroscopic techniques with the goal of connecting kinetics and energetics of fundamental dynamic states to macroscale device performance. 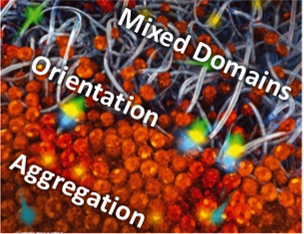 We connect these measured properties to detailed investigations of nano-to-mesoscale ordering using our advanced sychrotron X-ray techniques as well as a suite of standard characterization tools such as electron and scanning probe microscopies. The final goal is to develop quantitative models of how specific parameters of nanostructure can be used to control and optimize organic electronic devices such as organic LEDs, solar cells, transistors, and sensors.